may your joys never end. 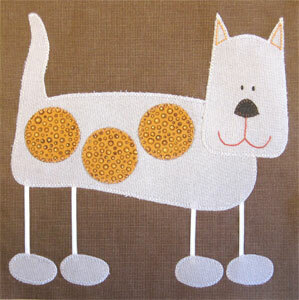 I've wanted to make these since Embroidery Garden first advertised to design. 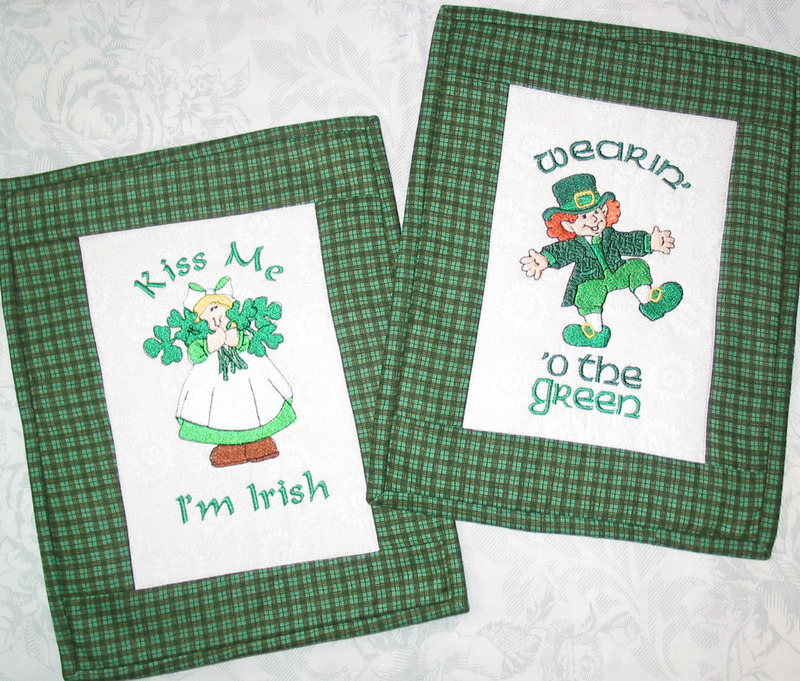 They are made all in the hoop on your embroidery machine. They take a bit to make but they're so cute & definitely worth the effort!! 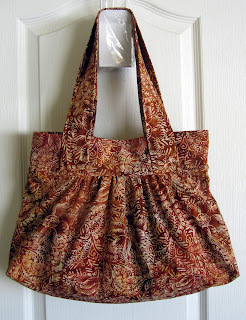 It was time for a new purse. 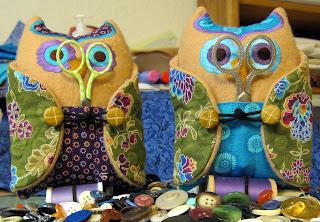 As I was finishing up a friends birthday gift today, I needed a couple of matching buttons. So out came the gallon jars of buttons & you just have to dump them to find those perfect ones, right. 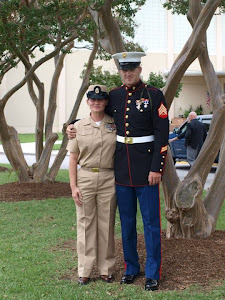 As I was digging through them I was thinking how my oldest grandson is turning 19 tomorrow. Where did the time go?? 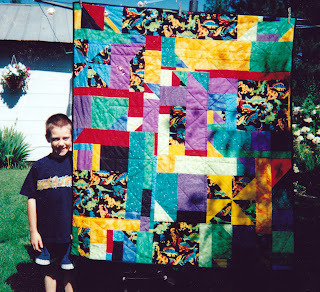 Damon lived with us for most of his first 6 years & spent hours in the sewing room with me. His favorite game was counting & matching the buttons. He played with them for hours. Then he would get the chicken pincushions & play pin the button on the chickens!! Oh how I miss those times. 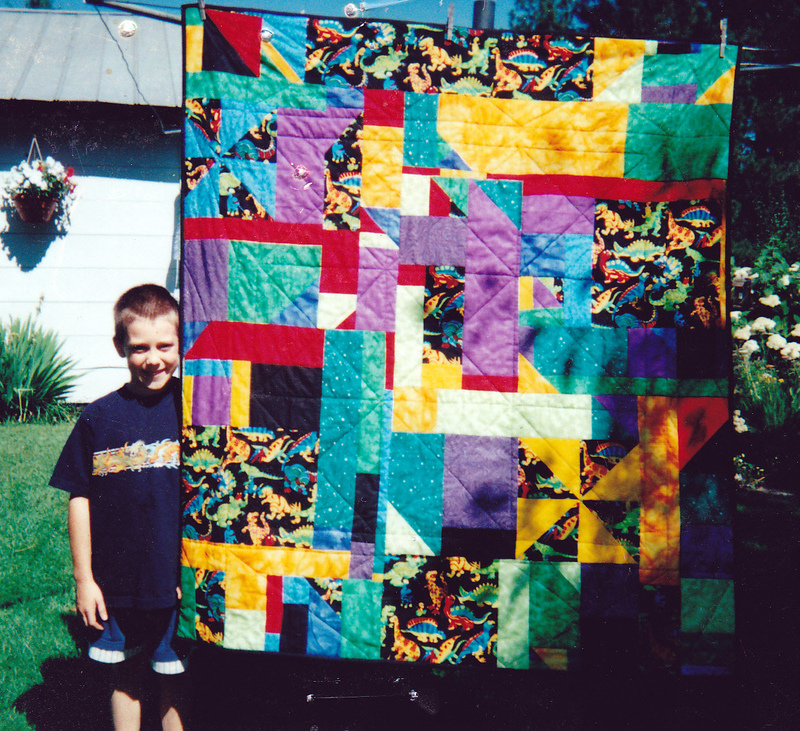 At 3 he was matching fabric, knew what a fat quarter was & picking out the bestest quilts to make for him. Here he is at 5. He was digging through a box of kid fabrics & found this Dino print. 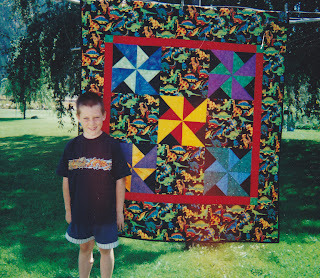 Then he designed the top & picked out all the fabrics right down to the binding! 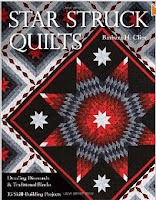 You can find them at Syverkstan Quilting. 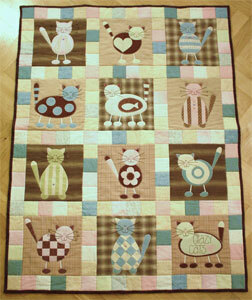 There's also the Crazy Cats BOM 2011 still available. The colors are really off in this picture, but it's going in the mail tomorrow so no time for more pictures. The white is really a cream/tan print. Oh well. it's done!! I found the poem for the label on the Internet. 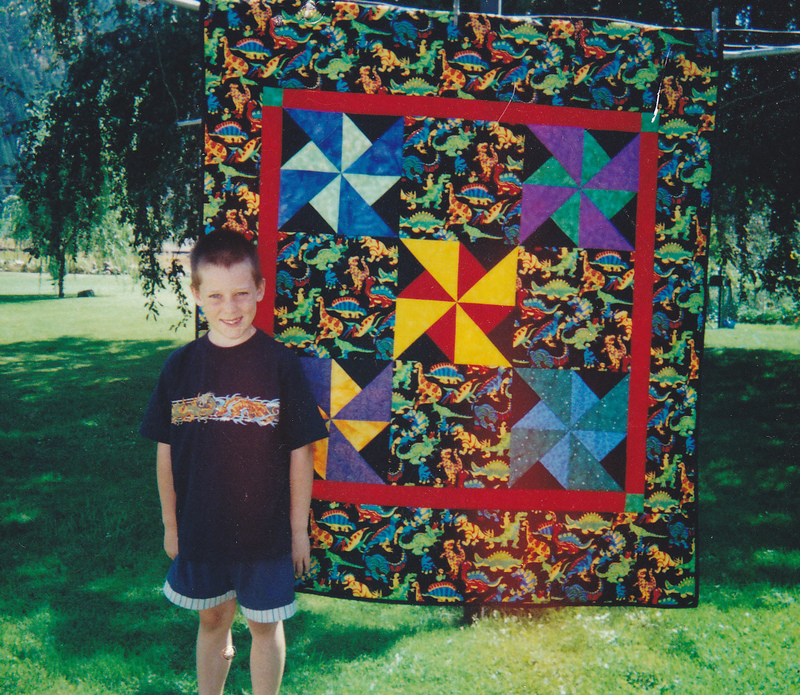 May this quilt keep you safe from harm. May it be your good luck charm. I do not know the challenges you face. But in your arms is a quilter's embrace. 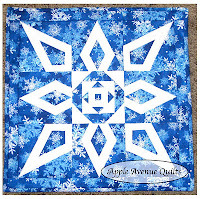 I thought it was perfect for a quilt going to someone I don't know. Christina is a a friend of my daughters. Thank you to whomever wrote it. I went searching to give credit & could not find it again. It's almost done. 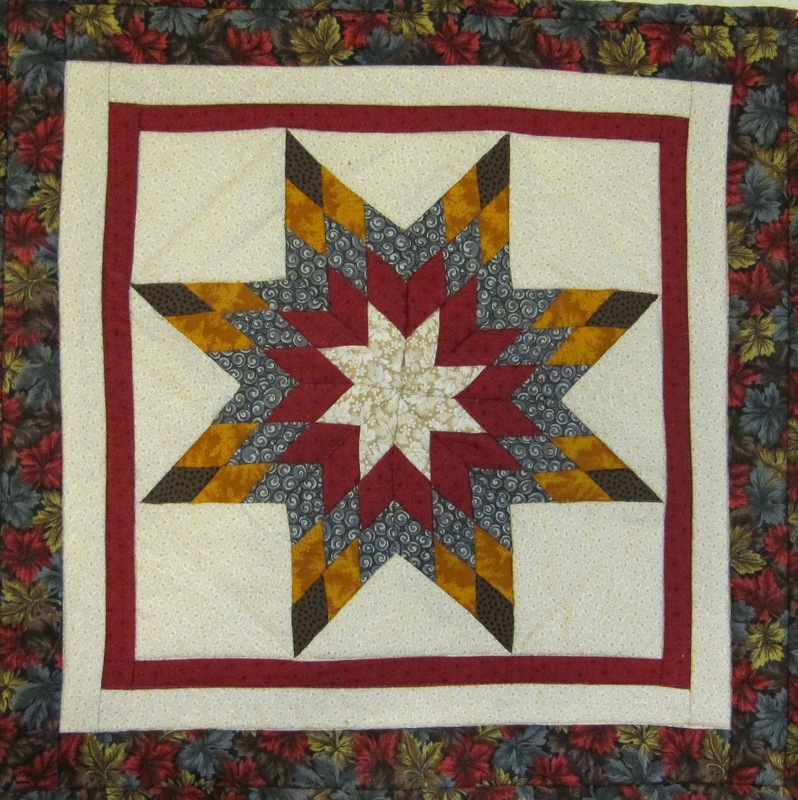 I was sick so much of January that this quilt was put on hold. I thought about sending it to my Ca. quilting cousin, but it would have been another month getting it done & back. So I'm doing a simple straight stitch using the edge of the walking foot as a guide. I happy with it & I'm sure she will be to. BUT before I quilt anything else Dale has to cut a hole in this table & make a shelf for the machine to sit on. 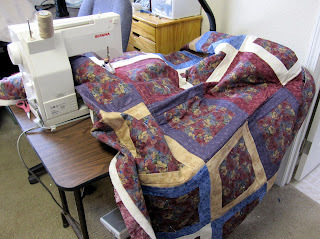 We have plans to build a nice big sewing/quilting table, but I don't want to have to move it & we will be moving from Nevada within the next 5 years come h*!! or high water. So I'll just make due until then!! I'll add a finished pic soon. Lone Star QAL, better late than never! And Saturday we spent the whole day trimming horse feet, currying, brushing, doctoring if needed & conditioning manes & tails. Then we went to dinner in town & fell in bed by 7:30. So much for a night life!! Here it is Sunday eve & I've accomplished absolutely nothing but feeding the critters. And how's my Lone Star going. 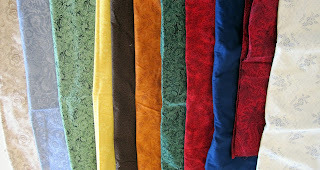 I've dug through my stash & pulled fabrics for what I'm hoping will be western/cowboy kinda colors. 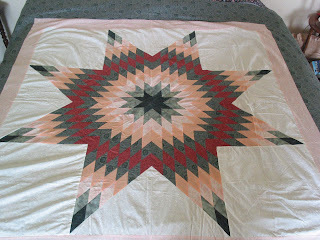 Dale has been bugging me to make a cowboy/horse quilt. 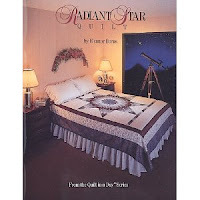 Well, I really don't want a horse quilt on my bed, so I'm compromising. Cowboy/Western colors on the front & Horses on the back. And if he doesn't complain I'll make him a Pinup Cowgirl pillow case!! 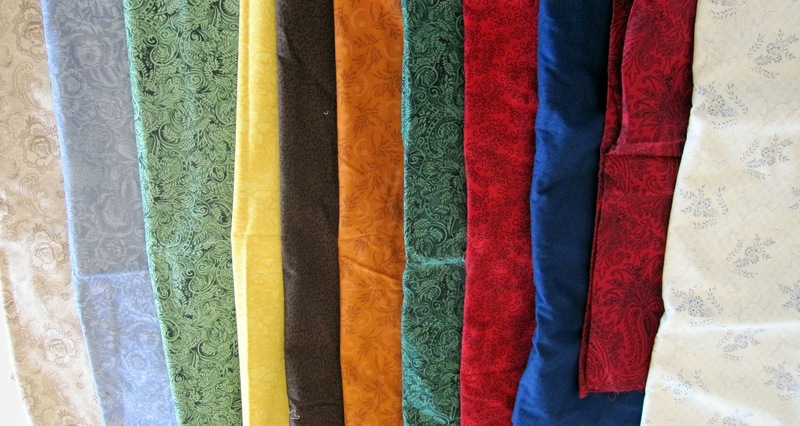 So without further ado, here's my fabric choices, all from my stash! Just noticed that the Med. Brown fabric is missing from this grouping. 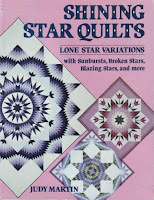 And here's a mock up of the star from EQ using solid colors. I've been reading & studying the different techniques used by different designers for making the stars. Most of are very similar. Main differences are in the pressing & the order of sewing the diamonds, setting triangles & setting squares together. 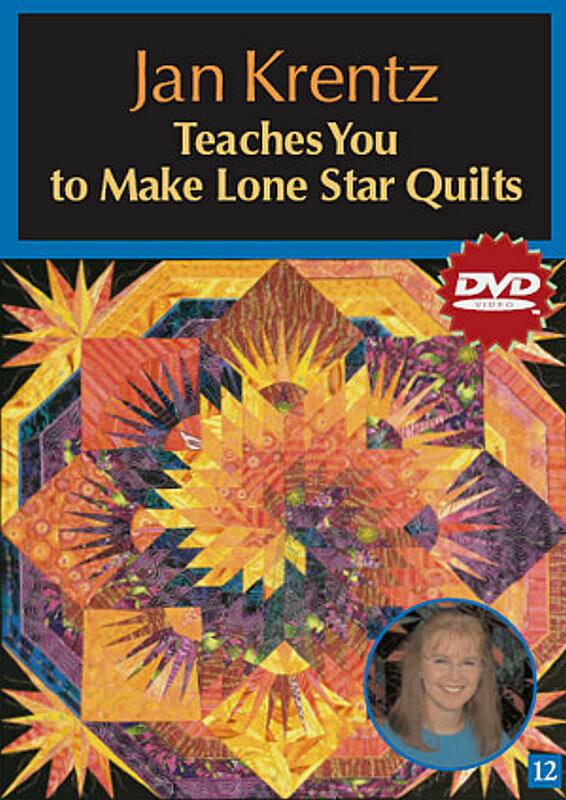 So basically you can use the pattern you like, with the piecing technique that work for you. 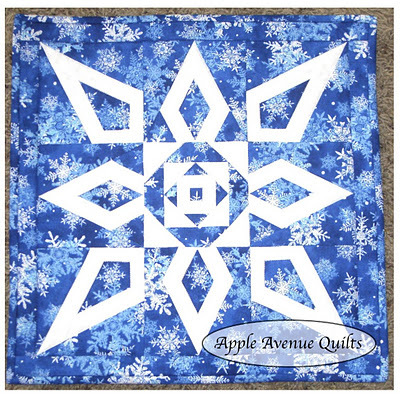 Unless there is paper piecing involved, then follow the pattern! The first block is up & just waiting for you! I know there's a lot more that I haven't found yet. So if you find them send me a link!! 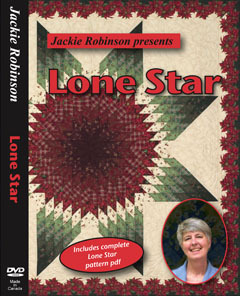 Quilt Times & Jaynes Quilting Room are co hosting a Lone Star Quilt Along/Support Group! Thank you both. 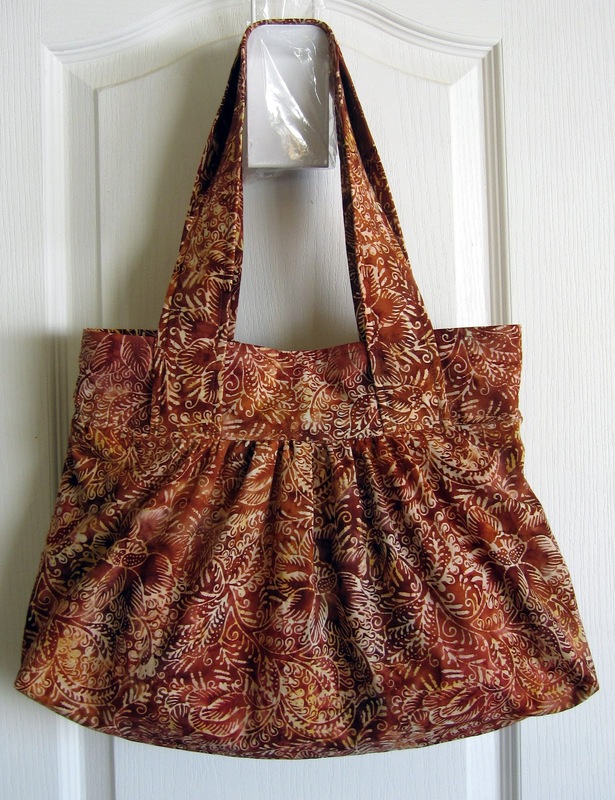 No patterns are provided but lot's of pattern suggestions, info & support! So if your interested, go check it out. 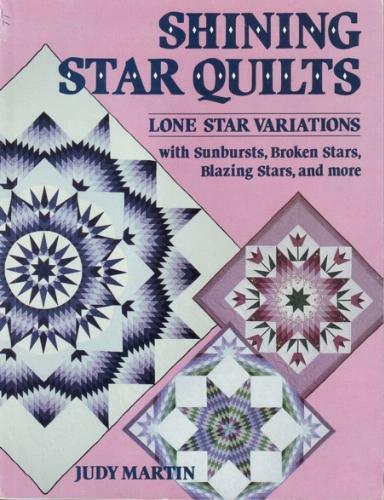 Here's a few of the Lone Star books I've used & or read plus there's a couple of great instructional DVDs too. You can find them all on Amazon. I haven't seen the Jackie Robinson DVD yet but there's a short promo on You Tube. I've made 4 of these, all strip pieced. So much easier. I'll admit here that my 1st was a 12" mini. Not the best one to start with & the center came out all wonky! But I finished it anyway... And I'll even show pictures. 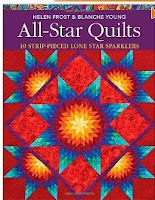 2nd one was a king size Radiant or Broken Star. I took a class from a young Amish woman in Libby Montana around 1998ish or so. It was in blacks, grays & burgundies. My oldest daughter has it & after looking everywhere tonight I could not find any pictures, asked & hoping to get one soon. The 3rd one was made for a friend & her husband at her request, I got the top done & then she changed her mind so it was never quilted but here's a picture of it before I sent it to the Australia Brush Fire victims. 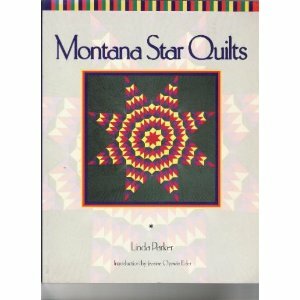 I used Eleanor Burns Radiant Star book. And last is another that hasn't been finished. 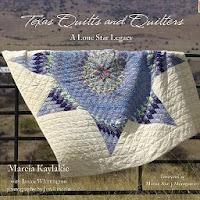 This one is lap/baby size & also made using the Eleanor Burns book. 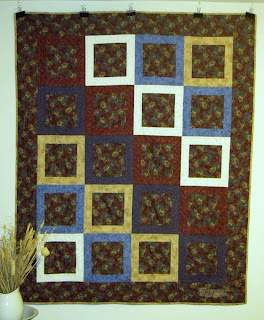 I plan to pull a bunch of Batiks and add pieced & solid border to turn it into a twin, hopefully! And here is the Mini Wonky Western Star! 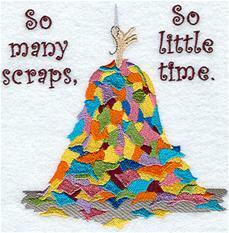 Someday I really need to make another & retire this one!